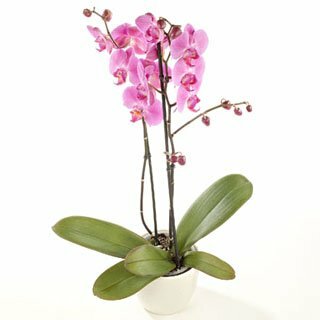 Did You Get or Give a Phalaenopsis Orchid for Mother's Day This Year? Hi Everyone. Welcome to the June Orchidaceae newsletter. I hope this newsletter finds you enjoying the orchids you grow, particularly if you were given the gift of an orchid for Mother's Day. Did you Get or Give a Phalaenopsis Orchid for Mother's Day? Here in the United States and Canada (and almost 50 other countries) last month was Mother's Day, May 10th 2015. Mother's Day is a great time to honor mothers and the entire female spirit. And many people choose to give orchids to the women they wish to honor. Since my traffic always increases in May around this time and I get many more questions regarding Phalaenopsis orchids I am going to focus this newsletter on these lovely orchids. I wrote a little orchid e-book last year. 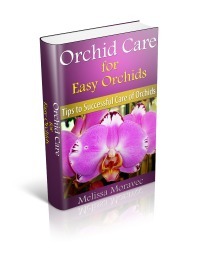 "Orchid Care for Easy Orchids". Some of you might remember that I sold it to my subscriber list before I put it on Kindle Direct. About 50 people took me up on my offer and I had really positive feedback on the e-book from about 20 folks. When I put it on Kindle Direct I had to agree not to sell it myself. If you want to check it out here is the link. One of the chapters is on Phalaenopsis. The text below the headline below this sentence is the entire chapter from the little e-book. A little gift for my subscribers! Flowering: Often in late Winter, early Spring Colors are varied often white, pink shades. Can be both large and miniatures. When learning about Phalaenopsis orchids it is important to note that there is a hybrid of Phalaenopsis and Doritis orchids. It is very similar in form to a Phalaenopsis, and it has very similar culture. Both of these orchids are easy to grow! The two Phalaenopsis in the above picture are seedling crosses from a community pot I bought many years ago. The community pot had 25 little miniature Phalaenopsis seedlings. They all have the same parents and came from the same seed pod so they are siblings. They all express the same miniature Phalaenopsis characteristics in size and all but one have slight variations in the pink, and pink and white color of the flower. But, only the one on the left has a wild color variation of the flower. The flower is very different from the other siblings. So these had all had the same parents but because they were a sexual cross, they exhibit some different characteristics. This is how orchid growers hybridize for different and hopefully more desirable characteristics. Phalaenopsis is listed by the American Orchids Society as the first orchid that is appropriate for a beginner orchid grower. Personally, I am very fond of these orchids. They have so many redeeming qualities. They are incredibly beautiful and elegant. They lend themselves to every décor, from Japanese modern, to Western, and all in between. They come in many colors, and sizes, and the blooms can sometimes last up to almost 4 months. They are easy to grow, very forgiving, and re-bloom readily compared to some of the other more fussy orchids. What is not to like about all of those qualities? 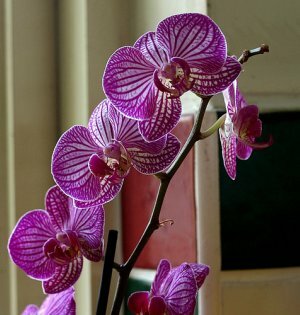 So, here is what you need to know to understand how to care for the number one easiest orchid. Phalaenopsis orchids are very popular, and with good reason. One reason is that it is an easy growing orchid for the beginner. Another reason is that the flowers can last three months or longer. And they are readily available in nurseries and big box stores. They have a graceful, arching spike with many flowers. In recent years orchid growers have developed hybrids that are multi-branching and multi-spiked so you can have quite a display when they are in flower. Phalaenopsis tend to flower in the late winter and the early spring. That said, I have had them flower in the fall as well here in Northern California. The name Phalaenopsis is taken from the Greek terms “phalaina” meaning “moth”, and “opsis”, meaning “appearance”, as the flowers have a moth like appearance. Phalaenopsis species can be found from Asia, to the Philippines, to New Guinea and parts of Australia. These areas have weather that is constantly warm and generally humid, providing the perfect natural environment for Phalaenopsis orchids. These plants are epiphytes, which means they grow on other plants like trees, but are not parasitic on the other plant. In the wild, they derive moisture and nourishment from the air and rain. 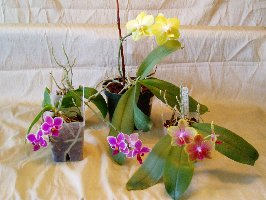 Phalaenopsis do not have pseudobulbs, whereas some other types of orchids such as Oncidiums or Cattleyas have these water storage devices that hold surplus water. Phalaenopsis are monopodial in growth and only store water in the leaves. One general caution about Phalaenopsis is to make sure that the pot they are in drains well. Take special care to make sure that the plant is not in a container that does not drain water or that has a plastic sleeve that would hold the water. Nurserymen often pot orchids in decorative pots this way to make them more attractive as gifts. And this is fine, unless the orchid is watered and not allowed to drain. Root rot is the most common problem I see as an "Orchid Doctor" and this is often the reason. You can keep the plant in the decorative pot. Just make sure it has drainage or has drained before placing it back in the pretty pot that does not drain. Phalaenopsis like bright light, but do not like direct sun. They prefer east or south windows where they get bright light, but again, no direct sun. I grow mine in a room with south facing light about 6 feet (2 meters) from the window. They have approximately the same light conditions as African Violets between 1000 to 1500 foot candles. The foliage should appear yellow-green, not dark green, if the light is correct. If the leaves are dark green, or the new leaf is growing longer and narrower than the old leaf, this is an indication that the light is too low. GIVE: Bright indirect light, about 1500 foot candles. No direct sun, a filtered window in the home, a shaded south, east, or west window is best. In the greenhouse, a bright but shaded area. The ideal day temperatures are between 65 and 85 F. (18 - 29 C). Ideal nighttime temperatures are between 55 and 65 F. (13-18 C). The normal home temperature of 72 – 78 F. (22 – 26 C.) is fine for Phalaenopsis. If you are comfortable with the temperature, your Phalaenopsis will be as well. In the fall, Phalaenopsis need the temperature to fall below 60 F. (16 C.) for three weeks to induce the plant to initiate a flower spike. A spike should start to appear about three weeks after this cold treatment. And, the flower spike will grow in the direction of the source of greatest light. It is also possible to grow Phalaenopsis under artificial light. Grow them 9 to 12 inches under fluorescent grow lights, or 4 to 6 feet under 400 watt high intensity discharge lights or high pressure sodium lights. Your Phalaenopsis should have a flower spike growing by February. If it does not, move it to where it will receive more light. Even a small incandescent light can make a difference. How often a Phalaenopsis should be watered is dependent on the potting medium. Bark retains less water than moss. Plants should be thoroughly watered when approaching dry, but prefer not to completely dry out. In my conditions, that is about once every week to ten days. However, when in doubt, go drought. DO NOT use water that has been water softened as the salts can kill your Phalaenopsis. It is important to give the plant a complete drenching when you water. It is best to water early in the day so that the leaves dry out. Do not leave water collected in the crown of Phalaenopsis as they are prone to crown rot. I water mine by putting them in a sink and running water through the pot 3 or 4 times over a 15 minute period. Then, if I am going to fertilize, I do it then as the roots have swollen somewhat and can absorb the nutrients. I mentioned that Phalaenopsis are subject to crown rot, so when watering, do it early in the day. It is best in many situations to water before noon so that the leaves have a chance to dry before it is cooler in the night. Do not let water stay in the crown for a long period. If necessary, use a paper towel or something similar to soak up the puddle of water in the crown, or have your Phalaenopsis located somewhere where it gets very good air circulation. GIVE: In most home situations once a week is enough. Water thoroughly, early in the day and do not let water stand in the crown for long. Provide good drainage. Like most orchids, Phalaenopsis orchids appreciate a more humid environment, typically between 40% – 70 % relative humidity. One way, other than misting (which I am not a big fan of due to the possibility of increased risk of fungal disease) to increase the humidity is to use a plate or saucer with little pebbles and water in it. Put the orchids ABOVE the water. This is critical. Phalaenopsis do not like "wet feet". This increases the humidity around the plant. Phalaenopsis like it somewhat moist. That said, I do let mine dry out sometimes when I get busy. You can also use humidity trays, like the ones I sell, very effectively. 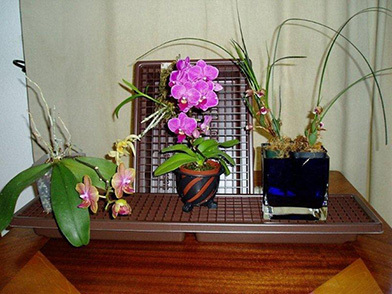 In fact, I have almost all of my 100+ orchids on these humidity trays. They are a fabulous orchid growing tool! If you are interested in checking them out further go to the humidity tray page on my website. They come in a variety of sizes and in both black or brown colors. They are VERY useful for growing any plants in the home. GIVE: Typically between 40% – 70 % relative humidity. Consider using a humidity tray like the one shown below. Fertilizer: Fertilize with a balanced formula (like 20-20-20, 10-10-10 or 7-7-7) every two weeks. I tend to use a non-urea based fertilizer for my orchids. However dilute the fertilizer to between 1/4 and 1/2 the recommended strength of the dilution indicated on the package. The adage is with orchids is to fertilize "weakly, weekly". That said, it is best to reduce the amount of fertilizer during the winter months when most plants are not in active growth. Do not fertilize orchids when they are dry. Only fertilize after you have given the plant a good drenching and the “velamen” has had a chance to absorb some water. Velamen, you ask? Velamen is the name of the thick spongy outer layer of cells on the roots of epiphytic orchids that absorbs moisture from the surroundings. That way your plant can properly uptake the nutrients in the fertilizer. In the spirit of full disclosure, I do not fertilize very often. Perhaps way less than I should. GIVE: A balanced fertilizer, diluted from the recommended amount. Use diluted fertilizer after watering and use it relatively frequently. It is best to consider re-potting Phalaenopsis every two years or so. Definitely when the media has broken down, as Phalaenopsis are prone to root rot. I plant Phalaenopsis in plastic pots, not in terra cotta, as the roots tend to stick to the pot. I use either the standard green ones, generally available in most nurseries, or the clearer/whitish ones, which I prefer. It is easier to see what the roots look like in the clear pots. But, what is exactly best for your Phalaenopsis will depend on where you are growing them. I have some on sticks and mounts that do beautifully. For re-potting: Phalaenopsis like a porous mixture. For many years I liked to use a mixed media for most of my orchids. I made a blend of medium fir bark, small fir bark, large perlite, charcoal, and red lava rock. Depending on the orchid, I would change the mix. More recently, I have been just using Best Grow's Orchiata. This is a sustainable growing medium produced from a00 % pure New Zealand Pinus radiata (Pine) bark. If making a mixture is too complicated or you cannot find Orchiata, just get some medium and some small fir bark for orchids from a nursery. It is often sold in small bags. Be sure not to get orchid mix. It should look like small pieces of bark, not like dirt. Size the pot to the orchid. Use plastic pots, not terra cotta or clay. You should be able to comfortably put the roots in the pot, not too big, not too small. I like to preserve all its roots if possible. Healthy roots are the basis of a healthy orchid. But, not all orchid growers agree with me. Some orchid growers will cut the roots off, leaving at least 6 inches (15 cm), especially if the roots are aerial and growing in many directions. As I said, I rarely do this, but some growers do. If you do cut them, use a sterile razor blade or sterile technique to do so. The Rule of Thumb is Phalaenopsis can need re-potting every 2-3 years. I sometimes go longer, but I look at the media. If it is breaking down, it makes the roots more prone to rot. So give these lovely orchids a chance. You will be rewarded for your efforts. GIVE: Use plastic pots and orchid bark. How often really depends on the health of the plant and the condition of the media it is growing in. Consider doing it every three years. OK that is it for this month.